Compression springs are devices made up of helically formed coils with pitch in between used to push back on an applied force or load in order to return to its original position when the force or load is released. They are the most commonly used type of spring as well as the most economical. There are many types of compression springs used to fulfill certain functions for many applications, devices, and/or mechanisms. 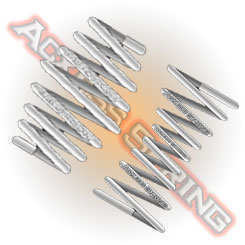 You may find several compression spring types in the mechanism of a firearm as well as other types of springs like torsion or extension springs depending on the type of firearm. You might also find them in devices or mechanisms that operate through buttons and such; the spring will be located behind the button to make sure the button returns to its original position after being released. 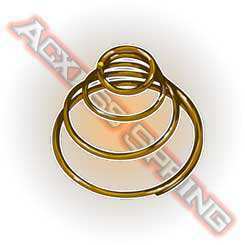 You will also find compression springs in the automotive industry used for the suspension of your automobile. As you’ve seen noted above, there are many compression spring uses but the list doesn’t stop there, you may find these springs almost anywhere. From a ballpoint pen or a notebook to a pogo stick or a medical device. The different types of compression springs are magazine compression springs, conical compression springs, barrel compression springs (convex and concave), and you might also find torsional compression springs which fulfill two functions by exerting a vertical force as well as a rotational force. Magazine compression springs are primarily used in firearms although they may also be required in other devices due to their oval/rectangular shaped coils. Conical compression springs are great for reducing your compression spring’s solid height due to the telescope effect their tapered shape provides. 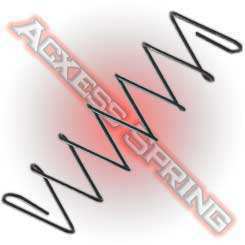 These springs are non-linear, therefore not exerting a constant amount of force when compressed. Barrel compression springs (convex and concave) are utilized to provide stability to your spring and may also be used to reduce the solid height. 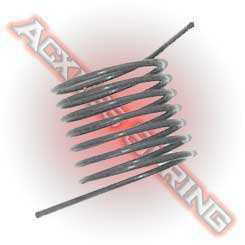 These springs, like conical compression springs, are non-linear. Torsional compression springs are used when you need a torsion spring to also complete the task of compressing or providing some sort of suspension against the objects around it while completing the task of exerting a radial force as well.